More than 70 clubs and organizations; see stevenson.edu/clubs for the full list. The University offers generous merit-based scholarships, and more than 95% of Stevenson students receive some form of financial assistance, including work-study, grants, and loans. Full-tuition Presidential Fellowships are also available. Stevenson University is excited to announce our new Biomedical Engineering program, beginning in fall 2020. 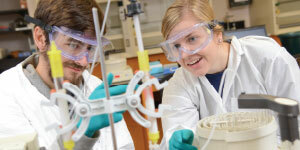 Emphasizing critical and creative thinking, the Biomedical Engineering program will provide students witha strong foundation in the sciences and math, alongside a biomedical engineering core. This program will prepare students to enter the workforce with problem-solving techniques, specialized skills, and a foundation in biomedical engineering—just as the job market is swinging in favor of biomedical engineers to bridge the gap between medical researchers and scientists and manufacturers. Additionally, our newest and largest academic building, which opened in fall 2016, houses the Beverly K. Fine School of the Sciences and the Sandra R. Berman School of Nursing and Health Professions. The new Kevin J. Manning Academic Center (MAC) triples the amount of space available for these growing programs. With dozens of state-of-the-art science laboratories equipped with industry-standard technology, four nursing simulation and skills labs, a terrarium/aquarium room, and much more, the MAC provides the space and equipment necessary to prepare students for professional careers. 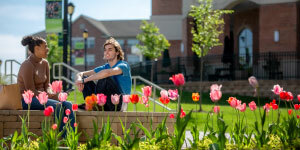 Stevenson University, located in the heart of Maryland, just north of Baltimore, offers an innovative education that combines a traditional liberal arts education with extensive career preparation. Our exciting approach to education quickly responds to real employer and student needswith challenging programs and experiences that will prepare you for a real future. Stevenson combines the best features of a liberal arts college—small classes, a broad perspective, and a thorough grounding in writing, analytical, and technology skills—with specialized, real-world professionalism. A Stevenson education is defined by exceptional experiences, connections to careers, and a welcoming, dynamic community where you’ll find the opportunities, mentoring, and support to define your vision of success. You’ll enjoy living on campus, exploring Maryland and the region, being involved in University life, studying abroad, and cheering on our championship teams. But you’ll also enjoy the opportunities that only Stevenson can offer: small classes with faculty who care and experiences inside and outside the classroom that allow you to explore, create, lead, connect, and succeed throughout and beyond your years as a student at Stevenson. You’ll learn from faculty who are active in their professional and academic fields and dedicated to teaching from experience. A 16:1 student-faculty ratio ensures that you can cultivate meaningful connections with your professors. Stevenson’s innovative, entrepreneurial spirit reflects the mindset you need for success in today’s world. We’re constantly seeking new opportunities and networks of support for our students, from new courses and degree programs to experiential learning, leadership, service, and internship experiences you can use to fulfill your life’s goals. We prepare students for the workforce from day one. Whether you’re still deciding on a major or know what you want to study, we offer a distinctive approach to exploring new paths, changing destinations, and mapping your vision for the future. With the support of our career experts and committed faculty, the process helps students develop a personalized strategic plan based on their motivated strengths, interests, values, and individual goals. There are a number of career preparation resources offered to students through Career Services: career advising, career fairs (major-, industry-, and veteran-specific events), on-campus interviews, networking events, graduate school workshops, service learning, and internships. It’s impossible to earn an education at Stevenson without being prepared for life after college. At Stevenson, exceptional experiences aren’t bound by classroom walls. We encourage students to continue learning outside the traditional classroom setting. Our students have deployed reef balls in Chesapeake Bay, explored Berlin’s architecture through a camera lens, traveled to France to play ice hockey, and participated in national leadership programs. Starting in your first year, with the support of our Center for Student Success and Office of Career Services, we’ll help you blend study abroad, service learning, research, internships, and other practical experiences that support your personal interests and career aspirations. Home to around 2,900 students, the residences at Stevenson University go above and beyond your housing expectations. We offer spacious apartments with full kitchens and roomy suites with two bedrooms and a private bathroom, combining the comforts of home with the excitement of independent living. Residence life that feels like home and a vibrant culture and social life are important components of the SU experience. Within the heart of Maryland, Stevenson students appreciate the beauty of rural surroundings with the convenience and appeal of a nearby urban setting. After expanding our campus in 2013, Stevenson opened the 200,000-sq. ft. Academic Center in 2016. The building offers state-of-the-art facilities for the School of the Sciences, School of Design, and School of Nursing and Health Professions. 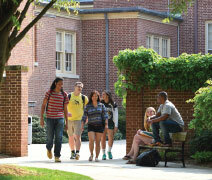 Our main campus in Owings Mills, Maryland, is a thriving center of student life and academics. Stevenson recently completed renovations to the Owings Mills campus. A new quad serves as an attractive outdoor gathering space and walkable link between buildings. Garrison Hall is now home to the Student Commons, which features one of our four fitness centers, club meeting rooms, a gaming room, and an eSports suite. Additional facilities introduced in fall 2018 include a coffee shop and reading room.